TrendMiner has expanded its advanced self-service analytics capabilities with ContextHub, a brand new central location for starting your time-series data analytics journey based on contextual information captured, entered or imported from a wide variety of sources. TrendMiner NV, a Software AG company, has announced their latest software update: TrendMiner 2018.R2. The release includes a completely new set of capabilities, collectively called ContextHub. Other additions include; OSIsoft PI Event Frames integration, a related context item search for fast filtering of time-series data, and further extensions to the recommendation engine that helps operators and engineers to speed up root cause analysis of process anomalies. TrendMiner enables process and asset experts to analyze, monitor and predict operational performance through trend analysis of time-series data. TrendMiner proudly announces the introduction of ContextHub, an extension of the platform that significantly increases the flexibility of annotation, providing process and asset experts brand new insights into their data. ContextHub is a repository, search engine and collaboration platform for context items that can be neatly aligned to assets, processes and events. The platform can be configured for the context itself to become a powerful new dataset that can be both visualized and analyzed; it also serves as a starting point for time-series analytics. Rob Azevedo, Product Owner at TrendMiner. TrendMiner, already deeply integrated with OSIsoft Asset Framework, now provides out-of-the box access to both historical and new Event Frames for OSIsoft PI System users and others. These ecosystem synergies gives OSIsoft customers a much easier way to gain access to Event Frames information, click through the related information, and kick-start their discovery and diagnostic analysis to continuously improve operational excellence. 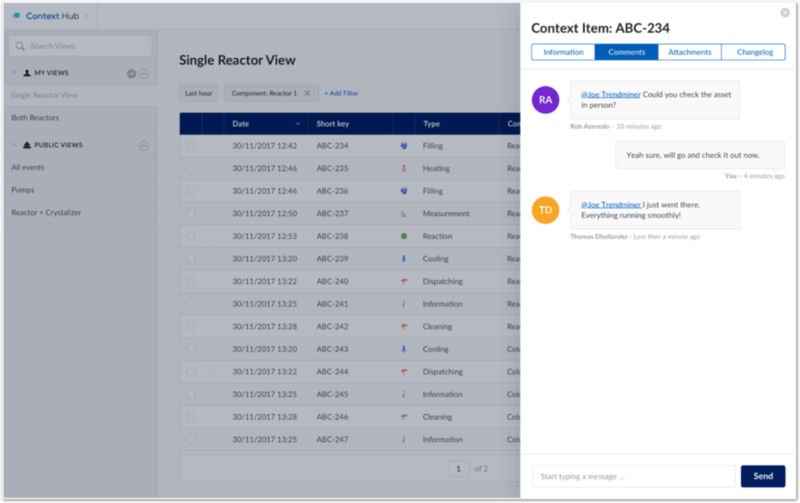 The new and novel ability to search for context items gives users the power to actively employ gathered context as part of the TrendHub analysis itself. It enables users to select saved ContextHub views, from which they would like to visualize, filter or overlay time periods in TrendHub. In this way context items become a rapid starting point for trend analysis, and facilitates filter requirements through all time series data. This effectively speeds up root cause analysis or if needs be, create fingerprints and monitors which can be used to send notifications to the control room and adjust process parameters when necessary. Easy and hierarchical organization of saved fingerprints which help monitor your process performance. The fingerprints used to monitor your process performance can now be used for early warnings. This will help avoid the trigger of hard alarms and support control room personnel to take appropriate action. For diagnostic analysis TrendMiner provides a compare table showing the statistical difference between a range of tags of interest. This compare table can be exported as xls-file to be used in other systems. Further extension of the powerful Recommendation Engine capabilities. This machine learning tool now uses the matching patterns found in the historical data to recommend potential root causes for process anomalies. This increases the likelihood of recommendations. 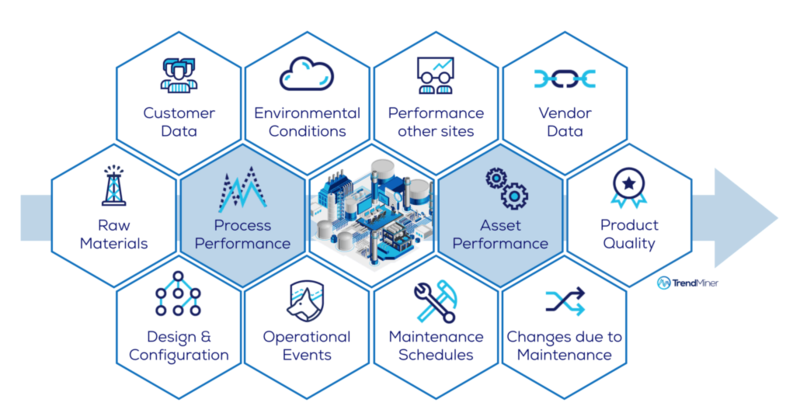 The full range of capabilities plus the new ContextHub and the several usability enhancements will serve to further reduce the time and effort it takes to solve equipment and process performance related issues. It is TrendMiner’s goal to help our customers make better decisions, faster by giving the power of analytics to the people who can interpret the data. For more information about ContextHub, watch our Webinar on Demand “Operating in the Fast Lane; Contextualize time-series data for smarter analytics”. Read the full TrendMiner 2018.R2 press release.